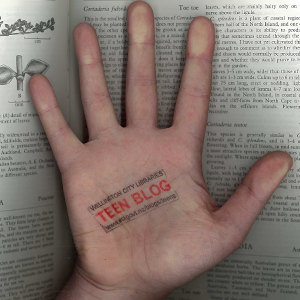 Teen Blog » Blog Archive » I don’t remember the title, but it’s BLUE. I don’t remember the title, but it’s BLUE. 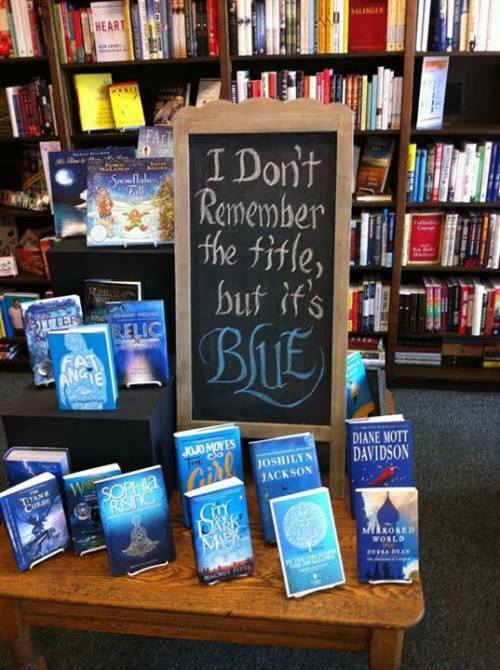 In honor of this wonderful display at Blue Willow Bookstore in Texas, here’s a collection of books with blue covers. Martin lives in a perfect world. Each year a new generation of genetically-engineered children is shipped out to meet their parents. Residents keep track of seasons by taking down the snow from their windows and replacing it with flowers. Every morning families gather to vote on matters of national importance. Today it is the colour of the president’s drapes. It’s business as usual, until a stranger comes to take away the smallest children, including Martin’s sister. No one’s talking about it, and Martin decides he has just two options – continue living in the unspoken looming danger zone, or leave the dubious safety of his home, HM1, and make his way through the supposed wasteland outside. Scarlett Hughes is very concerned with the lives of everyone around her all the time, and spends very little time thinking of herself. Out of the blue her sister Juliet comes home from school, pregnant and married to a man she seems to have no interest in, but who is completely besotted with her. Scarlett is prompted to think introspectively and consider the necessity of dreams and speaking the truth. Some girls act out by drinking, taking drugs, harming themselves, harming others. Kelleigh steals cars instead. In How to Steal a Car we are taken on a turbulent journey through Kelleigh’s day-to-day life, one car theft at a time. After Diego lands himself in probation for fighting, he doesn’t trust his probation officer, Mr. Vidas anymore. But Diego soon realises he needs Mr. Vidas’s help to keep his anger under control. To do that, he must confront the nightmares and memories he has been hiding from. But will anyone believe him, even if he does open up and tell the truth? It was clear Rose had a special fate from the day she was born. But her mother keeps the mysterious circumstances of Rose’s birth a secret, hoping to keep her from leaving home. But Rose’s nature can’t be denied forever. So when a great white bear turns up one cold autumn evening asking Rose to come away with it in exchange for health and prosperity for her family, she jumps at the chance. The bear takes Rose to an empty castle fortress, where she is joined nightly by a mysterious stranger. Slowly she begins to learn his identity, but in doing so she loses her heart and begins to realise her journey has only just begun. Brooklyn can’t sleep. Her boyfriend Lucca died only a year ago, and her best friend Gabe recently died of an overdose. She is haunted by Gabe every time she closes her eyes, but she can’t fathom why Lucca doesn’t appear too. Nico can’t stop running, from the pain of the loss of his brother Lucca. But emotions run high when Lucca’s ghost starts leaving messages for Nico, telling him to reach out to Brooklyn. But neither will admit they’re being haunted, and until then, no one can rest. Angie is broken. By her mother, her bullies, and her own belief that her war-hero sister could still be alive, Angie struggles to get through each day. Hiding under a mountain of junk food doesn’t work and things are looking bleak, until the arrival of KC Romance, the kind of girl who doesn’t exist in Dryfalls, Ohio. She is the only one who doesn’t see Angie as “Fat Angie” and knows all too well that the package doesn’t always match what’s inside.